The Home of the Commandants at Marine Barracks Washington is a living museum where all who enter or are fortunate enough to live there are surrounded by artists’ renditions of some of the most famous faces, places and battles in the Marine Corps’ history. Completed in 1806, the historic landmark is the oldest continuously occupied home in Washington and the names of many of the artists whose works adorn the walls have long since faded into the past. So, when Staff Sgt. Kristopher Battles was chosen to create the home’s newest painting, he knew it would be one for the history books — and that he’d be around long enough to see it hung on the wall. 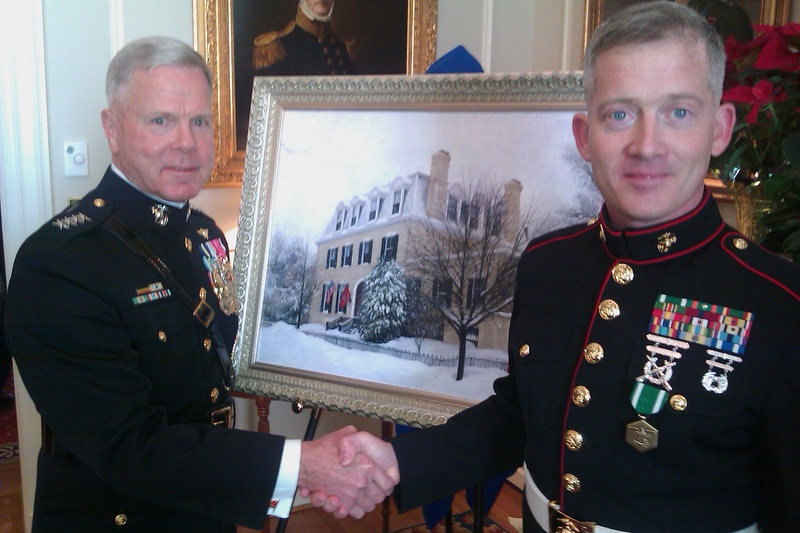 The oil painting is a faithful replica of the Home of the Commandants after a snowfall and is based on a photo taken by Amos himself in 2009. A reproduction of the work was used by Amos, and his wife Bonnie, for their 2011 Christmas card. To show his appreciation for Battles’ superb work, and for his contribution of more than 60 studio works for the Marine Corps in the last year alone, Amos awarded Battles the Navy Marine Corps Commendation Medal following the painting’s unveiling in the home’s living room on Jan. 1. Battles, who was invited with his wife to the traditional New Years Day “surprise” musical serenade for the commandant — a tradition that dates to the Civil War — thought he was just another invited guest and was surprised by the award. He hadn’t even met the commandant until that day. The painting of the Home of the Commdandants, Battles said, is now one of his favorites. 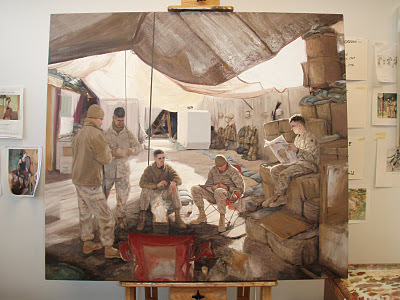 But there is one painting he did during a deployment to Iraq that is his favorite of all time. It’s called A Little Light Reading, Marines Enjoy the Morning. “I like it because it shows what it’s like to be in Iraq, and that’s something for future reference,” Battles said. Congratulations, Kris! The pieces are exceptional! Well done. Congratulations. Your work is awesome! DUDE Well done Sgt… You deserve the commendation, hopfully that means more good things to come… like perhaps a promotion to Officer??? Just my opinion but your work is amazing and you do the Corp Proud.